Expand your network connections to multiple devices instantly with the NetGear Soho 48-port Gigabit Ethernet Rackmount Unmanaged Switch. 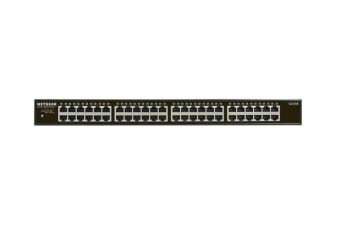 The NetGear’s Soho 48-port Gigabit Ethernet Rackmount Unmanaged Switch is the easy, reliable and affordable rackmount for your network. It offers plug-and-play installation with auto negotiation for automatic connectivity to your router or modem and traffic management using advanced QoS.